Monthly values for 1901/01 - 2017/12 V5.01. Monthly values for 1901/01 - 2014/12 V4.01. Monthly values for 1901/01 - 2010/12 V3.01. Long term monthly means, derived from data for years 1981 - 2010 V5.01. Long term monthly means, derived from data for years 1981 - 2010 V4.01. Long term monthly means, derived from data for years 1981 - 2010 V3.01. 0.5 degree latitude x 0.5 degree longitude global grid (720x360). 89.75N - 89.75S, 0.25E - 359.75E. Cort Willmott & Kenji Matsuura of the University of Delaware have put data together from a large number of stations, both from the GHCN2 (Global Historical Climate Network) and, more extensively, from the archive of Legates & Willmott. More details can be found here for temperature and here for precipitation. The result is a monthly climatology of precipitation and air temperature, both at the surface, and a time series, spanning 1900 to 2010, of monthly mean surface air temperatures, and monthly total precipitation. It is land-only in coverage, and complements the ICOADS (International Comprehensive Ocean-Atmosphere Data Set) data set well. For a complete description of the data as given by the providers, related datasets and references to relevant papers please see their web pages at the University of Delaware. PSD standard NetCDF4 230 Mbyte file for monthly air temperature file. PSD standard NetCDF4 283 Mbyte file for monthly air precipitation file. PSD standard NetCDF3 18 Mbyte file for each long term mean file. Missing data is flagged with a value of -9.96921e+36. Willmott, C. J. and K. Matsuura (2001) Terrestrial Air Temperature and Precipitation: Monthly and Annual Time Series (1950 - 1999), http://climate.geog.udel.edu/~climate/html_pages/README.ghcn_ts2.html. Please note: If you acquire UDel_AirT_Precip data products from PSD, we ask that you acknowledge us in your use of the data. This may be done by including text such as UDel_AirT_Precip data provided by the NOAA/OAR/ESRL PSD, Boulder, Colorado, USA, from their Web site at https://www.esrl.noaa.gov/psd/ in any documents or publications using these data. We would also appreciate receiving a copy of the relevant publications. This will help PSD to justify keeping the UDel_AirT_Precip data set freely available online in the future. Thank you! See list at bottom of for temperature. 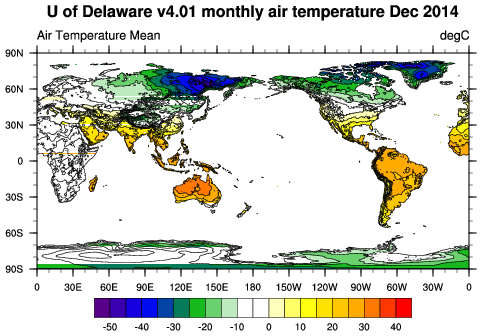 Center for Climatic Research Department of Geography University of Delaware Newark, DE 19716 The University of Delaware Web site offers extensive documentation of this data set. Please address questions on the analysis method to Kenji Matsuura (kenjisan@udel.edu) University of Delaware.